Recent studies of vocal development in infants have shed new light on old questions of how the speech capacity is founded and how it may have evolved in the human species. Vocalizations in the very first months of life appear to provide previously unrecognized clues to the earliest steps in the process by which language came to exist and the processes by which communicative disorders arise. Perhaps the most interesting sounds made by infants are the uniquely human 'protophones' (loosely, 'babbling'), the precursors to speech. Kimbrough Oller argues that these are most profitably interpreted in the context of a new infrastructural model of speech. The model details the manner in which well-formed speech units are constructed, and it reveals how infant vocalizations mature through the first months of life by increasingly adhering to the rules of well-formed speech. He lays out many advantages of an infrastructural approach. Infrastructural interpretation illuminates the significance of vocal stages, and highlights clinically significant deviations, such as the previously unnoticed delays in vocal development that occur in deaf infants. An infrastructural approach also specifies potential paths of evolution for vocal communicative systems. Infrastructural properties and principles of potential communicative systems prove to be organized according to a natural logic--some properties and principles naturally presuppose others. Consequently some paths of evolution are likely while others can be ruled out. An infrastructural analysis also provides a stable basis for comparisons across species, comparisons that show how human vocal capabilities outstrip those of their primate relatives even during the first months of human infancy. The Emergence of the Speech Capacity will challenge psychologists, linguists, speech pathologists, and primatologists alike to rethink the ways they categorize and describe communication. Oller's infraphonological model permits provocative reconceptualizations of the ways infant vocalizations progress systematically toward speech, insightful comparisons between speech and the vocal systems of other species, and fruitful speculations about the origins of language. 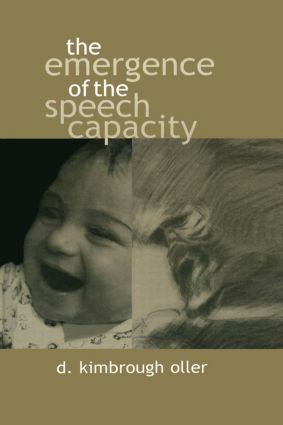 "In this weighty but well-organized volume, Oller delineates his 'infrastructural' model of language development, which can account for both the stages of infant vocalization and the evolution of human speech and language….At all times, Oller gives balanced, conservative interpretations of research results related to his model, and he is careful to explain technical terms that might be outside the experience of the reader. Highly recommended for professional linguists and graduate students at advanced (and perhaps high-intermediate) levels of study." "Kim Oller has written a truly remarkable synthesis on the origins of human speech. He integrates the latest understanding of vocal communication in non-human primates and our hominid ancestors with the earliest developmental stages of infant vocalizations. No one has provided a clearer or more detailed description of how speech emerges from the earliest vocalizations of human infants. This is a critically important book for everyone interested in the developmental and evolutionary origins of speech and language." "The Emergence of the Speech Capacity sets the basic parameters of the field and offers a principled way of evaluating and interpreting the author's and other research findings. Surprisingly light for its theoretical bounty, the book offers personal, heretofore private glimpses behind the empirical scenes of the largest and most coherent collection of studies in the area. This is one of the most remarkable books I have encountered in recent years." "Oller's infraphonological model solves age-old problems and provides fresh insights into the vocalizations of human infants and the communicative behaviors of our species and our ancestors. A deeply human book about a deeply human capacity." Contents: Preface. Interpretation of Communication Systems: The Role of Infrastructural Modeling. Myths About Babbling and the Tradition of Transcription. Reversing the Field: The Recognition of Protophones. Infraphonology: Overview and Central Results. Keys to an Infrastructural Approach: Infraphonology as a Basis for Vocal Comparisons. The Grounding of Vocal and Gestural Development in Biology and Experience: Physical Foundations for Speech and Sign Language. Canalization Results: The Stability of Protophone Development in a Variety of Contexts. Limits on the Disruption of the Canalized Pattern of Babbling. An Expanded View of the Landscape in Infant Vocalizations: Infrastructure for Sounds and Functions in Babbling. Protophones and Other Vocalizations. Primate Vocalizations in the Perspective of Infraphonology and Infrasemiotics. Infrastructural Properties of Communication in Humans and Nonhuman Primates. Possible Stages of Vocal Evolution in the Human Family. Comparing Fixed Vocal Signals Across Humans and Other Modern Primate Species. Infrastructural Pursuits in Vocal Development and Evolution.